Having braces in Fresno uncovers unique concerns. Hello, I’m Dentist Art Mirelez at Mirelez Wellness Dental. I support healthy oral hygiene and regular, consistent check-ups. Hygiene for braces is a bit different. Sweets and extra food stuck in hard-to-notice spaces may lead to plaque and yellowing around the appliances in your mouth. Avoid sweets, juices, sodas, anything that will stain your teeth. Also, sticky things like gum and caramel can break the equipment in your mouth. Sports are the center of life for many Fresno families. We’re an active community. I love that. A quality mouthguard provides important protection for both your teeth and braces. Maintaining healthy gums requires deliberate brushing and flossing. In the past, two minutes of quality brushing was acceptable. Braces are trickier to clean. What’s another minute to make sure every nook and cranny is taken care of? Humans are exceptional at noticing flaws. 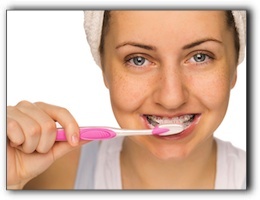 Check your smile often in a mirror to keep your braces free of obvious food particles. At first, people will notice the change in your smile. But if you’re relaxed about your new braces, soon your friends will simply look past them without even noticing. Thanks for visiting my blog today, hope it helps. I’ve been treating patients in Clovis, Selma, Oakhurst and beyond since 2003. You name it – dental implants, holistic dentistry, cosmetic – we do it. I’ve got the expertise, experience, tools, and team you need to maintain a healthy smile. I deal daily with teeth whitening, dental implants, porcelain veneers, sedation dentistry, and cosmetic dentistry. The cost of a smile makeover, cosmetic dentistry, and celebrity-caliber teeth may be more affordable than you think. Meet with me today and we can go over the possibilities and manageable options to meet your needs. Can’t wait to see you! Why Do Fresno Dentists Like Potatoes?